Please join Warren and The Editor for Day 4 of Revision Week, and find out how to win today’s “Free Partial Edit” from The Editor. 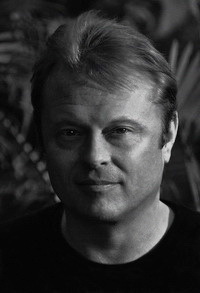 Warren Fahy has been a bookseller, editor, and a lead writer for Rockstar Games’s Red Dead Revolver and WowWee Robotics. His bestselling thriller Fragment, nominated for a BSFA and an International Thriller Award, was the subject of a bidding war at the London Book Fair and has been published in eighteen countries and optioned for film. 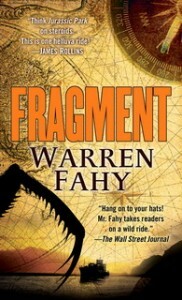 Fragment has been widely compared to the works of Michael Crichton and James Rollins. 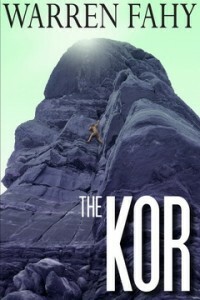 His thrillers include The Kor and Pandemonium, the sequel to Fragment. Warren and I met many years ago, when we both worked as editors for an information publisher. At the time, he was writing his first manuscripts on the side and I was months away from my first job in trade publishing, with Harcourt Children’s Books. It is with complete delight that I share Warren’s insights on revision with you today. *Warren’s interview follows the Rafflecopter form for today’s Free Partial Edit Giveaway. Scroll down for his full interview. I take care of character and story choices in the outline stage so I know and have that worked out in advance before I begin drafting the actual novel. Then I like to take at least 12 passes at the manuscript itself before I feel it’s road-tested enough. You do a lot of research for your fiction, which heavily incorporates real science. How does researching fit into your writing and revising process? I generally start with some idea that has in part been inspired by research, then research that idea to see what precedents exist for it in nature, science, or technology. At that point it becomes a back and forth, and often new research pops up along the way that either causes a problem (in which case I have to make adjustments) or supports the story, in which case I find a place suitable to mention it. Also, I run the manuscript past some science consultants to get their input, which is often invaluable. I do. I have four or five people I run a manuscript by a few times before the process is done. Wherever they stop reading a manuscript, I fix it so that nobody wants to stop there again. I pay attention to what they don’t say as much as to what they do say. Which draft typically gets shown to your editor? How much revising happens after the editor sees that draft? I submit the final draft and there is relatively little editing done by the editor. It is always best to deliver a final product and not a work in progress to an editor. In the case of Pandemonium, my editor, Bob Gleason at Tor, said, “it’s good to go” and so it skipped the editorial and went straight to the copy-editing/proofing stage. Can you share an experience of having a story problem you didn’t think you could solve but eventually did? Well, it’s all problem-solving, of course. You design the story from the beginning to avoid insoluble problems, ideally. 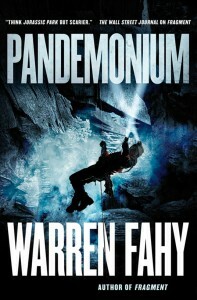 But one interesting problem I had with Pandemonium was that the male protagonist, I felt, was getting too much of the action sequences, leaving the female protagonist to do nothing. At first, I decided to give one action sequence that she could logically do instead of the male. Then I realized that one of his means of escaping from a subterranean octopus-like creature was to peel off his shirt, on which the suction cups of the monster had fixed. What should I do? I finally decided to play the scene exactly as it had been with the male lead, and let the other characters deal with it. It gave me a chance to make the other characters rise to the occasion and treat her with dignity, and the same admiration for getting out of the situation, that I gave the male protagonist. I felt that in times of duress, such things wouldn’t matter. My editor at HarperCollins in England suspected that I had added it for prurient reasons even though it wasn’t handled in a prurient way at all. She insisted that it go. I thought she was wrong on many levels, including the one that prompted her negative reaction. So I kept it. And it actually elevates the reader’s opinion of all the characters involved more than it would have with the male character in the scene. Hmm. I guess, when it’s printed and you can’t do anything more to it! Inspiration on a Thursday morning. Huzzah! Putting Fragment on my to-read list. Thanks, Deborah and Warren! Warren’s great, T. And thanks for letting me know that SF strikes you. I try to give Revision Week breadth by asking amazing writers from many categories and genres; it’s gratifying to know that’s working for readers. FYI – your bottom closing statement has been cut off for the past three posts. The black bar doesn’t do all the way to the bottom so I can’t read the last sentences. Sorry about that. The Rafflecopter does something wonky to my formatting. It’s now fixed! Happy to announce the winner for today’s Revision Week Partial MS Edit giveaway: Teresa Robeson. Congrats! I’ll send you an email directly, Teresa. Good luck to all with Friday’s FULL Manuscript Edit giveaway!